Belfast woman Anna Taggart thought baking was just part of her family history – but now she’s running her own award-winning business, and will be exhibiting at Northern Ireland’s biggest food fair in Belfast this week. Cafe Conor and the National Trust as well as coffee shops and the retail bakery trade across Northern Ireland. The firm, which has recently employed another full-time baker, is now looking at export opportunities in the Republic of Ireland and in the Middle East and has capacity to produce 70,000 biscuits per month from a specially-built facility at Ms Taggart’s own home. In 2012 she was made redundant from her part-time job and with only two established customers who regularly ordered for homemade products, decided to invest her own money and set up her own firm, Yummy Bakes. 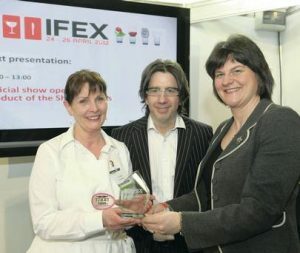 That same year she took a stand at IFEX, a trade event for the food, drink, retail and hospitality industries, and met thousands of industry visitors over the three days, establishing vital contacts and securing new business. She was awarded a Best Product accolade, which brought her to the attention of another exhibitor, Henderson Foodservice, which owns Spar and ViVo chains and now lists many of her products. Ms Taggart will be one of the producers on the Henderson stand at this year’s IFEX event in the King’s Hall from March 11 to 13. She said she had “no intention” of baking as a business, until fate stepped in. While she comes from a family of bakers who once owned a coffee shop at the corner of Fortwilliam Park in Belfast, Ms Taggart pursued other interests in life until redundancy and her mum’s ill-health changed things. After a number of strokes and moving into a care home, Ms Taggart’s mother told her stories of her baking, recounted recipes and encouraged her to bake for the residents of the nursing home – reigniting her daughter’s love for baking and her appreciation of her mother’s recipes. “My mother worked until she was 75. I was happy in my own work, I thought ‘why would anyone want to work that hard’?” she said. “However, after her third stroke she became very down, she was not interested in reading or the television, but talking about baking brought the sparkle back into her eyes. She would say ‘would you not go home and make these poor old people in the home something nice to eat’ and it was that that made me find my love for cooking again. “All the products I make are based on recipes from my mother. Everything has to be made using butter, nothing is synthetic, it must taste home-made and I think people are going back to those traditional flavours. “People say when you make things commercially you will never be able to taste the real quality but I don’t agree. For me, it has to be the best quality or I don’t want to bother. * 250 student and industry chefs are taking part in Salon Culinaire – consisting of The ChefSkills Theatre, with 14 individual category competitions and a team event. Northern Ireland’s biggest food, drink and hospitality event takes place in Belfast this week. Over 5,000 industry professionals are expected to attend the IFEX trade expo in the King’s Hall Pavilion, with millions of pounds of business expected to be done from Tuesday to Thursday. This year, exhibitors include show stalwarts like Stephen’s Catering, Henderson’s Foodservice, Masseys for Catering Equipment, Lynas Foodservice, Matthew Algie, Golden Glen Catering, BD Foods, Scan Coin, Bunzl McLaughlin, Bunzl Rafferty, and Frylite. There are also many new names including Brakes, Bewley’s, Rational UK and Solmatix. Central to IFEX is the Salon Culinaire, which combines the ChefSkills Theatre and La Parade des Chefs and features young cooks who will be competing over the three days. ChefSkills is where the talents of many of Northern Ireland’s celebrated chefs were first recognised. And La Parade des Chefs will see rival teams from Northern Ireland catering colleges go head-to-head in a real-time, purpose-built kitchen. Each team of chefs will be cooking and serving 60 covers and some of the industry’s most notable experts will be on hand at the King’s Hall to judge the three-day competition. A trade-only event which takes place every two years, the show is operated by Fresh Montgomery, which also organises the IFE, Hotelympia, The Hospitality Show and Food & Hospitality Ireland trade shows. Visitors can register to attend at www.IFEXexhibition.co.uk and the event can be followed on Facebook.com/IfexBelfast or via twitter @IFEX_NI.